Early calls, interview. Out into Ely to try to get some kitchen units sorted out and buy new shoes for small girls. It's good to take some holiday. Back home. Simplified our update statistics counter script to do more simple unique IP address counting; previously were blowing all memory on rather big machines by hashing unique IP addresses asking for updates per version; hmm, left the analytics running. Late interview, and partner call; slogged through more VclPtr bits. Up early; round of 1:1's, team meetings, beat back E-mail; tried to take some time off. Chat with Stephan, unwound some more VclPtr construction-time ref-counting madness. NCC; enthused at the older kids wrt. Old Testament history, timelines, where various stories fits in a chronology of the ANE. Back for a large lunch. Set too moving bits around the house, piano out of my office, sofas around the place; built a standing desk from an old door, as an alternative. Drove to Reading to Stephanie's 18th birthday party; lots of fun with the family - somewhat moderated by an hour of delay on a shut M25 - in the sun; read 'Selling the Wheel' to the babes who were (surprisingly) interested. Plugged away at mail and VclPtr problems. Harry Potter with babes in the evening. Mihai posted a nice blog with a small video of LibreOffice Online in action - hopefully we'll have a higher-resoluton version that doesn't feature some bearded idiot next time. Out to the Dentist for some drilling action. Back for some mail beat-back. Quick lunch, into Soham to collect H. and take her for her Viola exam, met her teacher. Celebratory ice-cream and hot chocolate. Home, profile reading, customer estimations. Dinner, put babes to bed re-organised office routing, cabling etc, moved machines downstairs. Happy Document Freedom Day - great to see Collabora partner: write some helpful thoughts about it. Of course we have a nice banner / wrap - and a custom LibreOffice theme that looks like this for the event: . Today we announced a collaboration between IceWarp and Collabora to start the creation of LibreOffice On-Line, a scalable, cloud-hostable, full featured version of LibreOffice. My hope is that this has a huge and positive impact for the Free Software community, the business ecosystem, personal privacy, and more. Indeed, this is really one of the last big missing pieces that needs solving (alongside the Android version which is well underway). But wait - this post is supposed to be technical; lets get back to the code. Performance - the Broadway model has the advantage of presenting the full application UI, however every time we want to do anything in the document - such as selecting, panning, or even blinking the cursor; we had to send new image fragments from the server: not ideal. Memory consumption / Scalability - another side effect of this is that, no matter how un-responsive the user is (how many tabs are you long-term-not-looking-at in your browser right now) it was necessary to have a full LibreOffice process running to be responsive & store the document. That memory consumption naturally significantly limits the ability to handle many concurrent clients. Having said all this, Broadway was a great basis to prove the feasibility of the concept - and we re-use the underlying concepts; in particular the use of web sockets to provide the low-latency interactions we need. Broadway also worked surprisingly well from eg. a nearby Amazon cloud datacentre. Similarly having full-fidelity rendering - is a very attractive proposition, independent of the fonts, or setup of the client. One of the key realisations behind LibreOffice On-Line is that much of document editing is not the modification itself; a rather large proportion of time is spent reading, reviewing, and browsing documents. 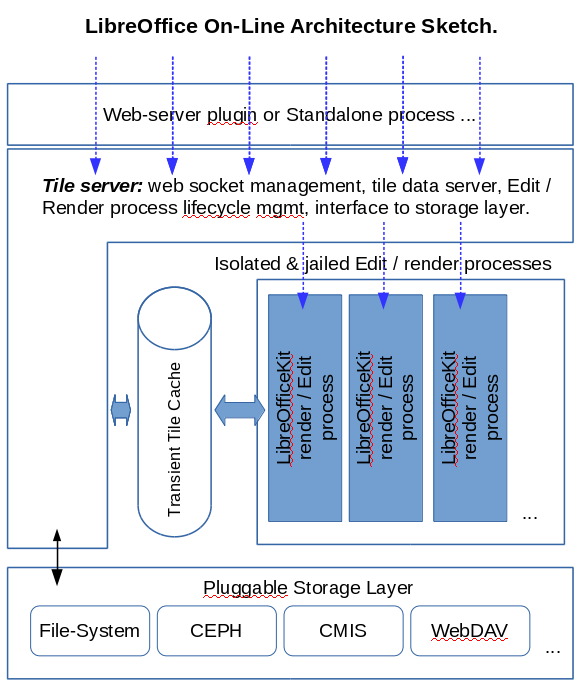 Thus by exposing the workings of document rendering to pixels squares (tiles) via LibreOfficeKit we can cache large chunks of the document content both on the server, and in the client's browser. As the users read though a document, or re-visit it, there is no need to communicate at all with the server, or even (after an initial rendering run) to have a LibreOfficeKit instance around there either. Clearly it is necessary to intercept browser keystrokes, gestures and so on, transport these over the websocket and emit them into the LibreOfficeKit core. Clearly when the document changes, it is necessary to re-render and provide new tile data to the client; naturally there is an existing API for this that was put in place right at the start of the Android editing work. Clearly as & when we decide that a user has wandered off, we can save their intermediate document, serialize the cursor location & selection - free up the resources for some other editing process. As/when they return we can then restore that with some small document load delay, as we transparently back their cached view with a live editable LibreOfficeKit instance. What does that look like roughly ? A final, rather important part of LibreOffice On-Line; which I've left to last is that of collaborative editing. The problem of generic, asynchronous, multi-instance / multi-device collaborative document editing is essentially horrendous. Solving even the easy problems (ie. re-ordering non-conflicting edits) is non-trivial for any large set of potentially intersecting operations. However, for this case, there are two very significant simplifying factors. First there is a single, central instance of LibreOfficeKit rendering and providing document tiles to all clients. This significantly reduces the need to a re-order asynchronous change operation stream, it is also the case that editing conflicts should be seen as they are created. Secondly, there is a controlled, and reasonably tractable set of extremely high-level operations based on abstract document co-ordinates - initially text selection, editing, deletion, object & shape movement, sizing, etc. which can be incrementally grown over time to extend to the core set of editing functionality. These two simplifications, combined with managing and opportunistically strobing between users' cursor & selection contexts should allow us to provide the core of the document editing functionality. 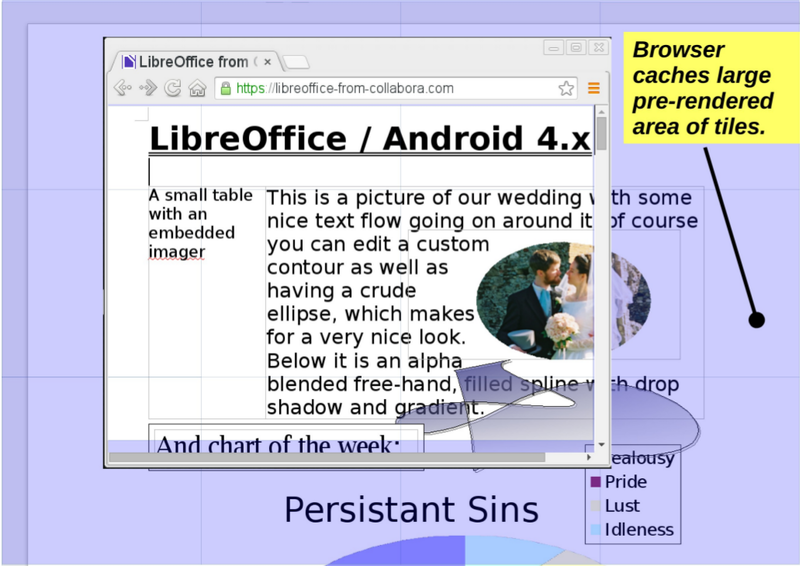 LibreOffice On-Line is just beginning, there is a lot that remains to be done, and we appreciate help with that as we execute over the next year for IceWarp. A few words about IceWarp - having spent a rather significant amount of time pitching this work to people, and having listened to many requests for it - it is fantastic to be working with a company that can marry that great strategic sense with the resources and execution to actually start something potentially market-changing here; go IceWarp ! Prep for Document Freedom Day tomorrow; chewed a lot of mail; misc. calls. Late customer call. Mail chew, lots of 1:1's. Lunch, team meeting, calls, another team meeting. More calls. Off to NCC, spoke, back for a quick lunch. J. out to collect an exhausted H. from a fine YFC weekend, watched a program on time with the older babes. Bed early. Up, set about getting some ethernet cabling into the new office through an existing hole. Rather pleasant to have a window to look out of, but cold. Plugged away at Colossians 4, oddly biblegateway seems to not respond for me - hopefully due to over-use. Worked on talk for tomorrow until late. Up early; somehow managed to fit an unfeasibly large desk into the car with J's help - to create the nucleus of a downstairs office. Plugged away at E-mail, and VclPtr fixing - finally wrote some documentation of what's going on there; needs some more work before posting to the list though. Plugged away at remaining issues with Noel's help. Bruce & Anne over for lunch. Chased endless more OutputDevice / VirtualDevice lifecycle conversions through our unit tests. ESC call, more slog. Admin interspersed with chasing horrible lifecycle issues through our unit tests with VclPtr bits in-place. Admin and E-mail backlog, interspersed with small build / bug fixes to retain interest in life. Built ESC bug stats. Lunch with J. Into Cambridge, 1:1 calls, lunch with Tim, team meeting, met with Basil and Sam; another team meeting, poked at VclPtr cleanup with Noel - really hoping to see the light of day at some stage there. Train home. Dinner. Read stories, viola practice with H. customer call until late; bit more hackery; sleep. Babes had made J. a whole box full of Mother's day goodies. NCC in the morning, Tony spoke. Home for a fine lunch. Slugged in the afternoon, Bronnie dropped in. Watched a How we got to here documentary on 'Clean' with the babes. Bed. Up; J. off to the British Museum with H. into Cambridge with the babes to the Cambridge Science Festival. Lots of interesting things - Philiae talk and satelite construction, genetic determinism of Cuckoos (un-trained by reed-warbler parents to parisitize them), lunch; Bees & plants; bangs & crunches - back to the office; met up with J. & H. there, and home for a Fish & Chip tea. Hacked at VclPtr bits left & right - finally starting to unwind and elucidate the rather odd toolkit/ / widget lifecycle until midnight. Morning estimation, sales call, customer call; lunch. Sync with Fridrich, more estimation - a tragic drought of hacking. Extremely amused by an Anti-Virus vendor flagging its own software as malware. From the experience of generating a new LibreOffice release every week which is ~100Mb of code small - it is easy to show that AV software is a bundle of superstition and duct-tape that looks for tiny not-very-convincing 'signatures' and erroneously flags things left & right. Glad they get hoisted by their own petard sometimes too. Into Cambridge to meet the UK trade & industry rep. - interesting chap. ESC call, horrendous train stuffing on the way home - 2x 3 carriage train-loads of people don't fit into a 2x carriage train (as you might expect) - taxi home. Mail chew. J. kindly dug through the expense queue for filing; positive board call. Mail; a round of 1:1's; more mail. Lunch with J. Back for a product team call, more chew, writing, then a consulting team call. Dinner. Built some stats. NCC, Simon Matthews spoke. Home for a large lunch, much slugging in the afternoon; bid 'bye to the parents; watched a documentary on 'cold' with the babes. Put everyone to bed. Built a socket blank to tile over for J. Out with H. and Father to Kelvedon Hatch Nuclear Bunker for an audio tour & inspection. Had lunch there, detour on the way home for an ice-cream. Bit of tiling in the evening, relaxed. Mail chew; encouraging re-estimation call; lunch. Sync. with Tim, poked at legalese. Admired J. and Father's kitchen tiling progress. Relaxed with the parents in the evening. Up; burned much of the morning. Pitch creation. Lunch. More work chew, built latest LibreOffice on Windows with new VS2013. Out for a parent's evening. Parents over for dinner, enjoyed catching up with them. Mail chew, document review, chat with Floeff; disappointing call with the TDF board. Encouraging call with customer. Mail chew, contract fiddling; binary build & up-load an Android debugging build - a 2.4Gb chunk of native code into a 1Gb APK, fun. Chat with Simon. Lunch. Two customer calls, sync. with Tor, dinner. Day of report writing, meetings etc. Product team call; had a review with Jacobo of his nice Android work, read some OwnCloud documents from Android. Consulting team call; more mail thrash. Built OT chronology / geography bits for the kids prep for visiting the British Museum; NCC - quick timeline / geographical bits, the wonders of 2000BC Mesopotamia and onwards. Home for lunch; tiling with J. attacking another section of wall; relaxed variously.